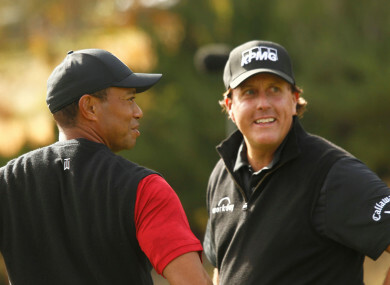 Long-time rivals Tiger Woods and Phil Mickelson (file pic). SEVERAL AMERICAN CABLE companies have decided to issue refunds to customers after technical fiasco prevented many from watching the start of the Phil Mickelson-Tiger Woods pay-per-view match in Las Vegas. One of the first to announce the refund was Turner Broadcasting’s Bleacher Report after some viewers were prevented from seeing the match while others were able to watch it for free on Friday. The match was billed as golf’s first pay-per-view event. “Prior to the start of the event, we experienced a technical issue with the B/R Live paywall that we tried to quickly resolve,” the distributer of the match Turner Sports said in a statement. “We decided to take down the paywall to ensure that fans who already purchased the event would not miss any action. This did not impact the live streaming of the competition and fans were treated to an event that was both engaging and memorable. Comcast Corp. also said it would return the $19.99 fee for the head-to-head match which Mickelson won over Woods on the fourth playoff hole to collect a $9 million payout. “Comcast will proactively issue a $19.99 credit to any Xfinity TV customer who purchased ‘The Match’ pay-per-view event,” said Comcast in a statement. Turner tried but failed to fix the technical issue with the broadcast so it took down the paywall allowing anyone to view it for free. Email “US cable providers offering Phil Mickelson-Tiger Woods refunds”. Feedback on “US cable providers offering Phil Mickelson-Tiger Woods refunds”.